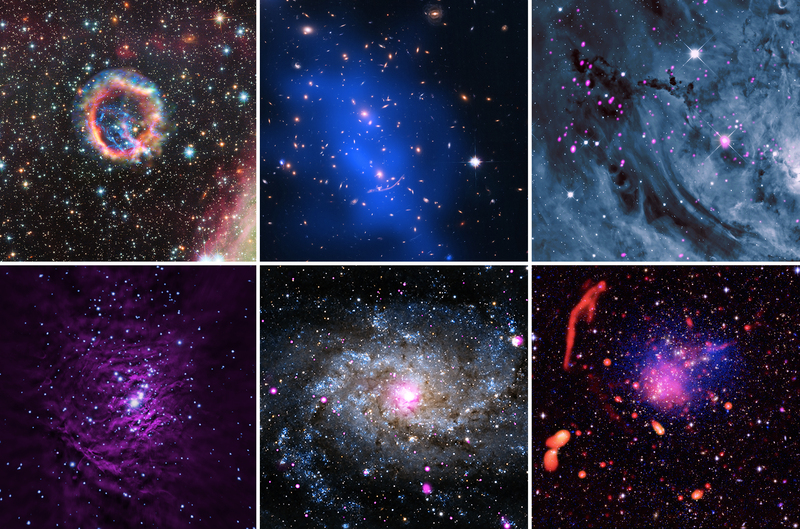 A selection of images has been released that include X-rays from Chandra and data from other telescopes. These sources range from the glowing debris of an exploded star in our Galaxy to two distant and massive galaxy clusters. By combining X-rays with other wavelengths of light, astronomers can get a more complete picture of astrophysical sources. This is the season of celebrating, and the Chandra X-ray Center has prepared a platter of cosmic treats from NASA's Chandra X-ray Observatory to enjoy. This selection represents different types of objects — ranging from relatively nearby exploded stars to extremely distant and massive clusters of galaxies — that emit X-rays detected by Chandra. Each image in this collection blends Chandra data with other telescopes, creating a colorful medley of light from our Universe. 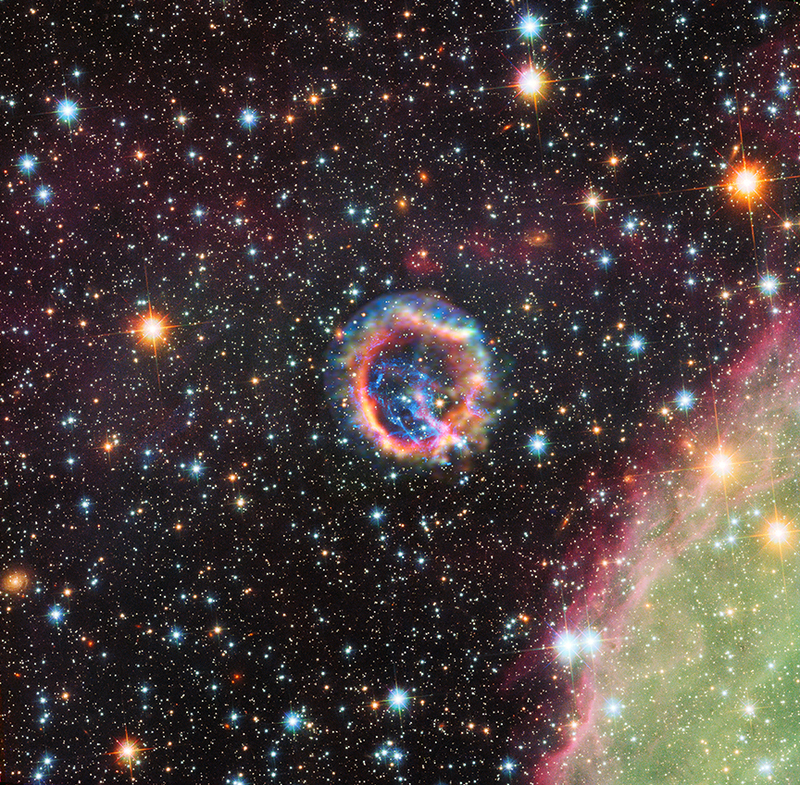 This supernova remnant was produced by a massive star that exploded in a nearby galaxy called the Small Magellanic Cloud. X-rays from Chandra (blue and purple) have helped astronomers confirm that most of the oxygen in the universe is synthesized in massive stars. The amount of oxygen in the E0102-72.3 ring shown here is enough for thousands of solar systems. This image also contains optical data from NASA's Hubble Space Telescope and the Very Large Telescope in Chile (red and green). Located about 4 billion light years from Earth, Abell 370 is a galaxy cluster containing several hundred galaxies. Galaxy clusters are the largest objects in the Universe held together by gravity. In addition to the individual galaxies, they contain vast amounts of multimillion-degree gas that emits X-rays, and dark matter that supplies most of the gravity of the cluster, yet does not produce any light. Chandra reveals the hot gas (diffuse blue regions) in a combined image with optical data from Hubble (red, green, and blue). Also known as NGC 6523 or the Lagoon Nebula, Messier 8 is a giant cloud of gas and dust where stars are currently forming. At a distance of about 4,000 light years from Earth, Messier 8 provides astronomers an excellent opportunity to study the properties of very young stars. Many infant stars give off copious amounts of high-energy light including X-rays, which are seen in the Chandra data (pink). The X-ray data have been combined with an optical image of Messier 8 from the Mt. Lemmon Sky Center in Arizona (blue and white). Look just below the middle of the three stars of belt in the constellation of Orion to find the Orion Nebula, which can be seen without a telescope. With a telescope like Chandra, however, the view is much different. In this image, X-rays from Chandra (blue) reveal individual young stars, which are hot and energetic. When combined with radio emission from the NSF's Very Large Array (purple), a vista of this stellar nursery is created that the unaided human eye could never capture. The Triangulum Galaxy, a.k.a., Messier 33, is a spiral galaxy about 3 million light years from Earth. It belongs to the Local Group of galaxies that includes the Milky Way and Andromeda galaxies. Chandra's X-ray data (pink) reveal a diverse range of objects including neutron stars and black holes that are pulling material from a companion star, and supernova remnants. An optical image from amateur astronomer Warren Keller (red, green, and blue) shows the majestic arms of this spiral galaxy that in many ways is a cousin to our own Milky Way. This composite image contains the aftermath of a giant collision involving four separate galaxy clusters at a distance of about 3.5 billion light years. Officially known as Abell 2744, this system is also referred to by astronomers as "Pandora's Cluster" because all of the different structures found within it. This view of Abell 2744 contains X-ray data from Chandra (blue) showing hot gas, optical data from Subaru and the VLT (red, green and blue), and radio data from the NSF's Karl G. Jansky Very Large Array (red).